For students wishing to do a science fair project on tardigrades, this book is essential. With over 100 pictures and detailed explanations, this book is written in a style intended to assist students and teachers in a variety of possible science projects with tardigrades. There are many science hobbyists at all levels who need an additional resource on this topic. Besides information specific to tardigrades, the book provides a basic primer on collecting and viewing specimens of many types under the microscope. Beginning with some basic information about tardigrades, the book explains the wheres and hows of finding these fascinating creatures. Covered are the essential techniques of sample collection, specimen and slide preparation, and the basics of microorganism viewing under a microscope. How to build science fair models of tardigrade eggs and tardigrades is explained in detail with step by step pictures. Also included are bonus sections showing how to build a microscope camera adapter, and how to build a plant press for preserving leaves and flowers. For anyone wishing to embark on a new voyage of scientific discovery, this book will help point the way. What temperatures can they withstand? Did they really survive the vacuum of space? You no longer have to do a time consuming web search to find the answers. 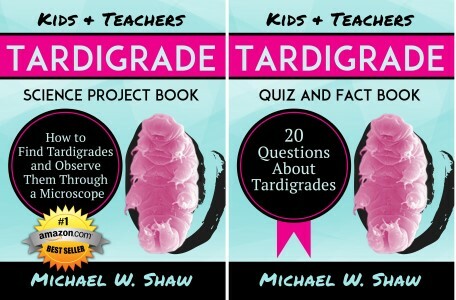 Get the facts about tardigrades all in one place  the Tardigrade Quiz and Fact Book. Whats nice about this book is that learning is fun because a quiz helps your memory retain information. And the pictures help you remember the answers. Imagine talking to a judge at a science fair with confidence because you know all about tardigrades. Your conversations with friends and family will not just leave them impressed, but theyll want to hear more. The questions will not be about tardigrades but about you. How did YOU get interested in tardigrades? Did you ever see one? Do you have any right now as pets?